Alright, so, it’s time to start the new session, I'm gonna put stuff into some spoilers, because it'd be too long otherwise, just like last time. The idea for the game is basically a turn based resource management and development simulator. In it, you take the control of a group of 20 people of one of five fantasy races and develop them from a tribe of hunters and gatherers struggling to survive to a people using whatever combination of Magic and Science that you fancy. The five starting races are Humans, Elves, Dwarves, Orcs and Goblins. Each race has advantages and disadvantages. Humans are fairly plain and average, but they adapt to their environment much more quickly than the other races. Elves are weak, frail and they take the longest to reach Maturity, but they can avoid harmful animals, are better at tracking down rare pray and, most importantly, have the longest lives out of all races. Dwarves have more Health then any of the other five races and they can resist Poisons and Illnesses. They are also a bit stronger and longer lived then Humans. Orcs are the strongest of the five races. Their lives are a bit shorter but in return they breed a bit quicker than Humans. Goblins are as weak as the Elves and even frailer, but they require less food than any other race. Their lives are also much shorter but they reach Maturity the quickest of all races and have a significantly higher chance to give birth to twins. The Stats for each Person are: STR, Health, Hunger; Duration of Pregnancy, Age of Childhood, Age of Maturity, Old Age, Maximum Age, Starting Age and the chance for twins. I will also list whatever special ability they have here. I will first list these stats, then I will explain what each one does. STR is short for Strength. It represents someone’s ability to inflict damage upon their enemies and their ability to carry things while moving. The damage will be explained when I explain fighting, the carry thing when I explain moving. Health represents someone’s ability to withstand damage. If someone’s health reaches zero, they are killed. Health heals naturally. Hunger represents someone’s need for food and water. Each edible item has a number of food points. At the end of each turn you need to spend food to satisfy the hunger of all your people. If you don’t, they starve to death. I will explain more about this in the section about Food. Age is given in turns. A turn represents 3 Months, so there are 4 Turns in a Year. The stages of life are: (Pregnant Woman) -> Infant -> Child -> Adult -> Old Person -> Death by old age. Infants and Children have no STR, they can’t take any actions and they need to be taken care of. Old People have -50% Productivity and can’t breed. Productivity is a hidden Stat that is naturally always 100%. Productivity affects the number of items you gather and the number of turns you make progress while researching or crafting. A Person with 0% productivity can’t take any actions. Changes to productivity are always added or subtracted, never multiplied. If you have two sources giving you -50%, then you get -100% (which puts you to 0%), if two sources give you +50%, you get +100% (which puts you at 200%). All of this will get explained further later. A Turn represents an amount of Time of 3 Months. I will now first list the different steps of each turn and then explain what happens at them. This step only exists so that turns are clearly separated. Here you choose what actions each Person should take this turn. I will explain the possible actions a person can take after I finished explaining the Turn. If an action takes more than 1 turn to finish, not assigning a new action to that person will automatically continue the previous action. Assigning a new action will cause the old action to terminate without any results. You cannot start an action that takes multiple turns, pause it and then continue it later, nor can a different person take over and continue the action instead of the person that originally started it. I roll to see which wild animal you encounter. Normally this encounter affects every person you have control over, but there are some options that can change this. You have a 10% chance to encounter no animals, a 50% chance to encounter common animals, a 25% chance to encounter Uncommon Animals, a 10% chance to encounter Rare Animals and a 5% chance to encounter Very Rare Animals. If another player decides to raid you, kidnap someone from you or to try and conquer you, this is also the point where that happens. This will be explained among the possible actions you can take. Everyone who didn’t die during Step 3 will now do the task you assigned them during Step 2. Here you choose how to assign food. If the food has special properties, you need to assign it directly (For example, berries have a chance to be poisonous, so you need to say EXACTLY who eats any berries and how many), food without special effect can be distributed without naming exactly who eats what (For example, since Roots are worth 2 food points, if you have 20 Humans, you could just say they eat 100 Roots, you do not need to assign which Human eats which Root). Everyone grows one turn older. People that reach a new age category advance to the next category. People that reach their maximum age die of old age. Food that isn’t fresh goes bad (it vanishes), then food that IS fresh stops being fresh. Anyone with less than their maximum health regains 1 point of health. Research that was finished during Step 4 now comes into effect. I will now post, telling you what happened during Step 7, give an update on what’s in your Storage, give an update on what research has been finished and any other noteworthy stuff and then ask you to make a post assigning actions to your people for them to take during the new turn. These are actions you can assign to your people each turn. Finished research can unlock new possible actions for you to take. You can send out a person to gather either Food or Material. What exactly they find and how much is randomized and depends on the environment biome of the tile. Food is needed to prevent Starvation, Material is used to craft things or for fuel. Crafting and Fuel will be explained later. You can send out groups of people to hunt animals. A group needs at least 1 person in it but can be any size you want besides that. The hunters have a chance to find the animal depending on its rarity in the environment biome you are in. The chance to find common animals is 100%, Uncommon animals is 90%, Rare animals is 50% and Very Rare animals is 10%. How many animals you encounter depends on the animals. Fighting will be explained later, Animals will also be explained later. If at least 1 person is told to guard, only people that were told to guard will fight in Step 3. On one hand, this allows you to protect your other people. On the other hand, people assigned to guard can’t do anything else that turn, so they aren’t productive, and smaller groups are of course weaker in a fight. People can craft stuff, though you will need to unlock the options of WHAT they can craft via research. 1 Male and up to 3 Females can breed with each other. The result of this is that the Females get pregnant. Males and Females of different races can attempt to crossbreed, but only 1 Male and 1 Female can breed this way. Multiples are of course possible (2 Males could for example breed with 5 Females). A Person that is pregnant can’t take any actions (except give birth once the pregnancy is over). A Person that is Pregnant requires twice as much Food while they are Pregnant. Only Adults can breed. If an Infant or a Child isn’t being taken care of by an adult during Step 4, they die, unless they were born this turn. Only a Person that gave birth or that Took Care of Infants last turn can chose to take care of Infants. 1 Person can Take Care of up to 2 Infants or up to 4 Children of the same race as they are or up to 2 Children of a different race. Certain buildings you can unlock via research require you to “Man” them. That means you must assign a person to that building in order to make use of it. Most Magic things you research give the person that researched it the option to cast a spell. The effect of the spell is explained in the Magic that was researched. If two groups fight, each group deals damage to the opposing group equal to their STR. Damage is assigned randomly between the members of the groups. No member can be assigned more damage than their health. A group of 5 Orcs raids a field in which 4 Dwarves are Guarding. Each Orc deals 7 damage divided randomly between the 4 Dwarves. They deal a total of 35 points of damage, enough to possibly kill one Dwarf, but since the damage is divided randomly, it is somewhat unlikely. The Dwarves deal 24 damage, also possibly enough to kill one Orc, but even less likely. A group of 10 Dwarves raids a field in which 4 Elves are Guarding. The Dwarves deal a total of 60 points of damage. Since each Elf has only 15 Health, this kills them all. The Elves still deal a total of 16 points of damage divided randomly between the Dwarves though. However, this will likely barely scratch the Dwarves and can’t possibly kill even a single one of them. While fighting, two things can be important, “Attacking” and “Hitting”. Anyone involved in a fight counts as “Attacking”, triggering any effect keyed to it (like weapons for example). Anyone in a fight is “Hitting” everyone they deal damage to, similarly triggering effects keyed to it (like poisons for example). A Dwarf is Guarding a field and has a weapon that gives them +1 STR while attacking and a Poison that deals 1 damage to every enemy they hit. If 2 Goblins try to raid that field, the Dwarf deals 7 damage divided randomly between the two and an additional point of damage to each that they deal at least 1 point of damage to, which is likely both Goblins. Animals work similarly to people during a fight. They have stats, they deal damage and they die if you deal enough damage to them. Animals can go extinct in a field, if too many of the same type die during a single turn. How many exactly depends on the rarity of the animal in that environment and a secret “Extinction” stat depending on the animal type. Here I will explain reproduction in more detail. It is important to note that while Infants and Children can’t take any actions, they are still considered normal people and thus require as much food as anyone else. They can still get involved in fights and can similarly be killed. Also keep in mind that someone needs to take care of them, so that person can’t take any other actions either. When you have stayed in the same environment long enough, the newborn people become adapted to that environment. What exactly that means depends on the environment they are adapted to, though it is generally a good thing. Normally, it takes 3 generations to get adapted. That is to say, Person 1 has been born in the environment, has a child (Person 2) in this environment, who has a child (Person 3) in this environment, who has a child (Person 4) in this environment. Person 4 will be adapted. This is only counting the SHORTEST string, so if Person 3 has a child with a person that has lived in this environment for fewer generations, their child WILL NOT be adapted. The people involved have to stay within the same environment from birth till the birth of their child in order to count. If a Person is adapted to the environment and has a child, the child will also be adapted to that environment. The number of generations it takes to get adapted differs, depending on the race and on whether or not the person is adapted to a different environment. A Person that is adapted to a different environment takes 5 generations instead of 3. A Human takes 1 generation instead of 3, or 3 instead of 5 if they are adapted to a different environment. If an animal or a person is Flying, prevent all damage dealt by attackers that aren’t flying or are using ranged weapons. Blocked Movement: If anyone moves onto a tile that blocks movement, they can't move any further that turn. If you have trouble understanding any of that, please ask. I have purposely kept some information away from you for now, because, if you are interessted, I'd like to test how a "blind" run of the game would work out. Basically, you will only know how long research takes once you started researching, you will only know what the research does once you finish researching it, you will only get info about other environments or animals or food or material or anything else when you encounter it in the game. I am not sure if that's how I'd like the game to be played, but it is something I am curious about and something I clearly can't test myself. If you want to join, simply post which race you'd want to start as and choose a tile on the following 100x100 map. I'd strongly suggest starting on a tile with Clean water and to avoid desert environments though, because surviving there will likely be harder. Again, if there is anything you'd want to know about, feel free to ask. If I remember correctly someone wanted AW61 and elves and someone wanted BQ97? I'll take BQ97, yes, and Dwarves as my race. Can you randomize my race and starting tile? Quick note: Each Unit of Water gives 5 Water points. Each turn, each person needs Water points equal to their hunger. So for example, a human on a temperate tile needs 2 Units of Water each turn. The first turn is in Spring, the second in Summer and so on. I'm gonna edit the other tiles into this post in a moment. "A nice Plain with plenty of fresh grass and a few trees. It has a Lake." Lake: There are 1000 units of Water on this tile. At the end of each turn, add 100 units of Water, to a maximum of 1000. The Water quality on this tile is always Clean or worse, the Water quality can NOT improve above Clean. "A hot Plain with hardy grass and few trees. It has a River flowing through it." Hot: There is a 20% chance for Heatstroke in Spring and Summer. There is a 10% chance for Heatstroke in Autum and Winter. 50% new Water units in Spring and Summer. 200% new Water units in Autum and Winter. Beings and farming requires twice as much Water each turn. River: There are 200 units of Water on this tile. At the end of each turn, add 100 units of Water, to a maximum of 200. The Water quality on this tile is always Clean or worse, the Water quality can NOT improve above Clean. 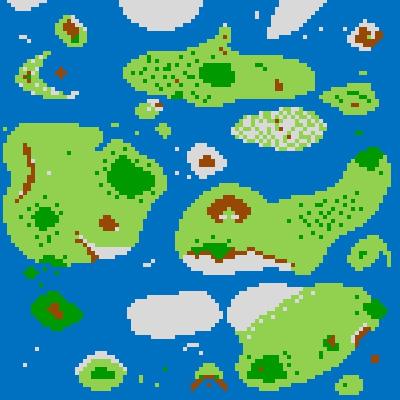 Tiles with rivers block movement. "A damp and hot Forest with mighty trees. A River runs through it." Forest: Each player can have no more then 15 buildings in this tile. Dwarf 3: Basic interactions research. Dwarves 4 - 12: Horse hunting. Dwarves 13 - 20: Food gathering. Elves 11-13 research tools, fire, and basic interactions. You randomly encounter 8 Wolves. Your Gatherers find 24 Clams, 1 Moss, 11 Twigs, 18 Clay, 17 Reed and 2 Sand. Your Hunters found and killed 2 Deers. Goblins 1, 2, 3, 4, 5 and 6 have researched Simple Spellcasting, Tools, Fire, Basic Interactions, Herbalism and Basic Fitness for 1 Turn. Goblin 7 and 8 got pregnant. The Wolves dealt 1 damage to Goblin 2, 5, 8 and 11, 2 damage to Goblin 3, 4, 6, 9, 10, 13, 14, 15 and 20 and 3 damage to Goblin 7, 12, 16, 17, 18 and 19. The Deer dealt 1 damage to Goblin 16 and 20 and 2 damage to Goblin 17. You randomly encounter 5 Monkeys. Your Gatherers find 20 Grain, 22 Roots, 6 Moss, 4 Clams, 3 Nuts, 3 Tuber, 1 Fruit and 5 Spices. Your Hunters found and killed 3 Horses. Dwarf 1, 2 and 3 have researched Tools, Fire and Basic Interactions for 1 Turn. The Monkeys dealt 1 damage to Dwarf 3, 8, 11, 12, 17 and 20 and 2 damage to Dwarf 2 and 14. The Horses dealt 1 damage to Dwarf 4 and 7 and 2 damage to Dwarf 9 and 10. Your Gatherers find 73 Fruit, 67 Berries, 12 Roots, 9 Cocoa Beans, 8 Coffee, 19 Clams and 5 Spices. Elf 11, 12 and 13 have researched Tools, Fire and Basic Interactions for 1 Turn. Your Hunters found and killed 2 Aurochsen. Bosmer 15, 16, 17, 18, 19 and 20 have researched Basic Fitness, Herbalism, Simple Spellcasting, Fire, Tools and Basic Interactions for 1 Turn. The Aurochsen dealt 1 damage to Bosmer 2, 11, 12 and 13 and 2 damage to Bosmer 5 and 8. Dwarves 1-3: Continue their respective research.